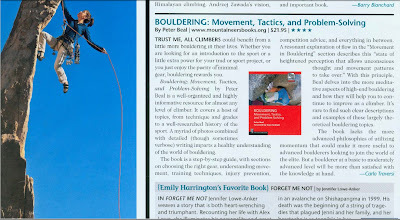 I received my copies of Bouldering: Movement, Tactics and Problem Solving recently and have been looking it over again, this time as a finished book. It is very difficult to think at all objectively about a book after being involved in writing and editing it for so long. It's even more difficult for me to then go out and say to everyone within earshot (or on the Internet) you really should buy the book. But I think you should and here's why. First of all, I wrote the book with only one goal in mind, to put between two covers all the information and ideas to set a climber, whether beginner or advanced, on the path to excellence. There are no personal war stories, extraneous (and soon to be dated) anecdotes about famous climbers, or other filler. Instead there is page after page of practical directions and advice, copiously illustrated by some of the best photographers in the climbing world, including Andy Mann, Andrew Burr, and Caroline Treadway. Also included are personal perspectives, featuring two lengthy pieces from Dave Graham, the master of the contemporary scene and John Gill, the creator of modern bouldering. Shorter pieces from legends such as Frederic Nicole, Marc Le Menestrel, Ben Moon as well as more current stars such as Ty Landman, Alex Johnson and Daniel Woods round out the picture of what bouldering is about. My approach to the sport of bouldering is that of a lifelong devotee as I have been a boulderer for over thirty years, practicing it with as much enthusiasm and devotion in my late 40s as I did in my early teens. I believe my attitude towards the sport has kept me active and involved in the current scene, aware of the latest techniques and equipment. I think that the book reflects the latest developments in the sport while staying firmly rooted in the enduring values of the past, especially involving environmental ethics. 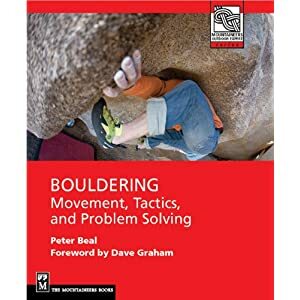 So if you are looking for a tool that can help you get started in the sport as a total beginner or advance within the sport of bouldering, I think my book is an excellent resource to invest in. 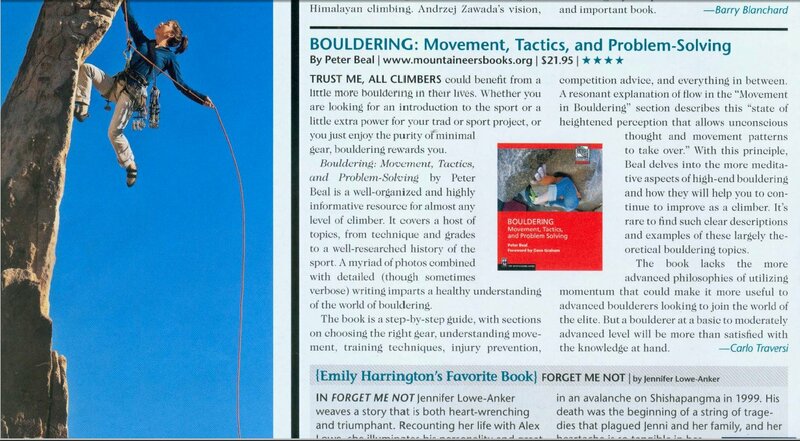 The book is available from a number of outlets including Amazon, Mountaineers Books, and local outdoor stores. You can also contact me directly via this blog or the Facebook page for the book.